“If the Canada Line resulted in some more police in order to protect that … police and hiring much cheaper transit security folk,” said Bateman. When the long-awaited Evergreen Line starts to roll late next week, there will be no additional TransLink police to patrol it, although the corporation says it is working on hiring more officers. “Until those decisions are finalized — and we hope that will be fairly soon — we will redeploy the patrol officers we have to ensure the entire system, including the Evergreen Line, is appropriately policed,” said transit police spokeswoman Anne Drennan. Officers redeployed to cover the Evergreen Line will include personnel usually assigned as extra staff to busy stations at peak times. “This redeployment, while we’re hoping that it will be something that will be augmented by additional officers in the not-so-distance future, it’s something we feel we will be able to initially cope with whatever needs we have on this system, as it’s increased by Evergreen,” said Drennan. TransLink has a police force of 167 personnel and the last time more officers were hired was for the opening of the Canada Line in 2010. “If the Canada Line resulted in some more police in order to protect that line and keep users safe, then the Evergreen Line, which is essentially the same kind of investment, ought to have the same kind of incremental police presence, so the entire line can be kept safe with transit police rather than local governments having to try to figure out how to do it from the ground,” said Coquitlam Mayor Richard Stewart. Coquitlam, according to Stewart, has hired its own specialized uniformed crime reduction unit to make certain any criminal impact felt by other communities with the arrival of SkyTrain, won’t be felt there. “The team is focusing on hotspots. I would expect TransLink would do the same thing on the rail. “I assumed that they were going to take the position that fare gates changed the game enough that we could now redeploy some officers whose role it was to protect the fare revenue and use them more for what they were intended for,” said Stewart. 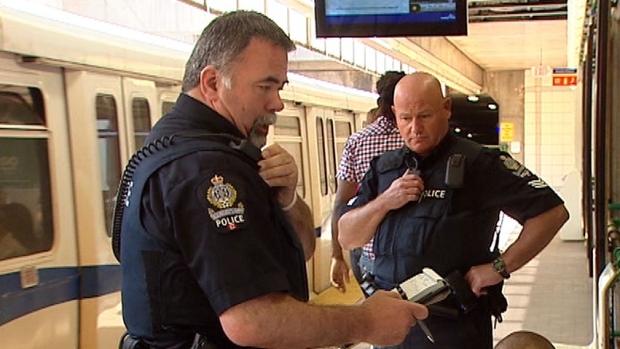 Fare gates are exactly the reason why Jordan Bateman, of the Canadian Taxpayers Federation, says there’s no need for TransLink to hire more police officers. “We should actually be going the other way, scrapping the transit police and hiring much cheaper transit security folk,” said Bateman. “Evergreen stations and surrounding areas have been designed to maximize security and rider safety through the use of a number of crime prevention tools,” said Peter Fassbender, B.C.’s minister responsible for TransLink. Those tools, according to Fassbender in an email to CBC, include the use of open, light and uncluttered spaces, fare gates,and security by Transit Police and its partners. “It is my expectation that appropriate plans and resources are in place to ensure the safety and security of passengers on public transit,” said Fassbender. 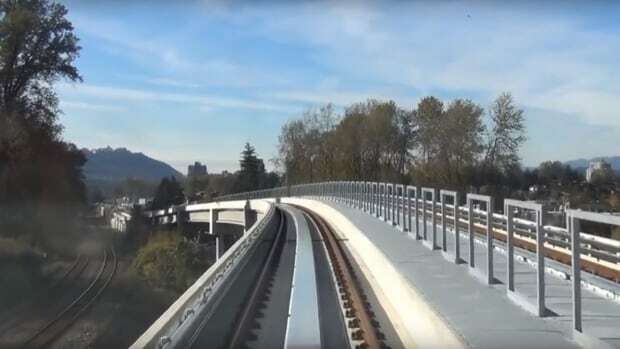 The $1.43 billion, 11 kilometre-long Evergreen Line through Metro Vancouver’s Tri-Cities region is scheduled to open, Dec. 2.